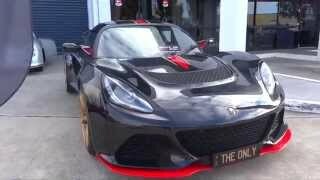 When we talk about the sports cars, Lotus Exige S is that one model; we can never take off from list. Moving ahead with the very knock of year 2014, Lotus decided to pay homage to its Formula One success and thus they introduced the all new Lotus Exige LF1 2014. Let us have a close look at the review of Lotus Exige LF1 2014 to know the way company defines its special models. 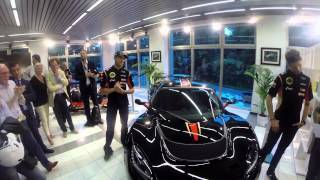 Moving to the interior of Lotus Exige LF1 2014 you can clearly have the glimpse of I being a ‘limited edition’ model. Adored with black getting contrast with gold trim, the cabin gives unmatched glimpse of perfection through its luxuriously sportive arena. Leather upholstered seats portray LF1 logo with a limited edition badge over them. The same saga of LF1 logo can also be noticed over the gold outlined black floor mats. Dashboard looks clean with only important controls mounted over it while the three-spoke steering wheel is cleaner with a round golden logo in center. Hand brake and gear knob gets the metallic touch, with same trend spreading its wings over the bottom of door panels and seats. In all the interior of Lotus Exige LF1 2014 is commendably designed to make its 81 models speak loud the reason behind their creation. 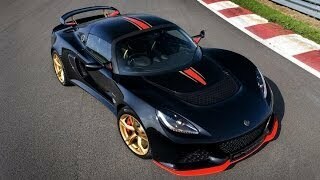 Exterior of Lotus Exige LF1 2014 is gorgeous amalgamation of black body with accents of gold and red over it. The 17/18 inch matte-finish five-spoke cast-alloy wheels are wrapped in Pirelli P-Zero Trofeo tires for perfect performance. Front spoiler gets the blend of red beneath the trapezoidal grille amidst two large air vents. Moving ahead red strip can also be noticed over the rear end of hood, moving till the trunk through its roof. The gold finished wheels feature red brake calipers that portray a sportive aggressive look of the all new Lotus Exige LF1. Moving towards the rear fascia of Lotus Exige LF1 2014 you’ll notice a large spoiler over the gold supports covering the entire trunk. This rounding up the exterior of Lotus Exige LF1 2014 you have, a luxurious, sportive and elegant model waiting to rule the streets. Lotus Exige LF1 2014 though is a limited edition model but it brings the same 3.5 Liter V6 engine generating total output of 345 hp and peak torque of 400 nm. With its power the Lotus Exige LF1 2014 top speed reaches mark of 170 mph while the 0-62 mph sprint gets knocked in just 4.0 seconds. 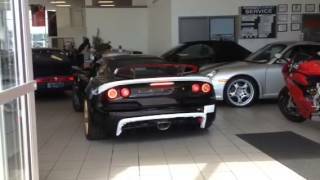 The credit to this especially goes to the four Mode Lotus Dynamic Performance Management system, which includes launch control, exhaust-bypass valve and optimized suspension settings which improve your driving experience.